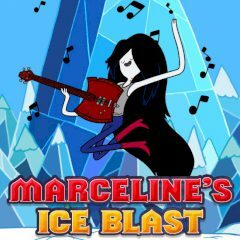 Marceline is a source of loud music and while Finn and Jake like it, some creatures find it annoying. Well, it's their problems and you must show them who is the boss here! Have you ever wanted to learn playing guitar? Marceline knows everything about it, but some creatures can't stand the sound of such volume. But Marceline can't stop because she is having guests, that are having fun! Finn and Jake follow her, so use the power of sound to protect them from the creatures.